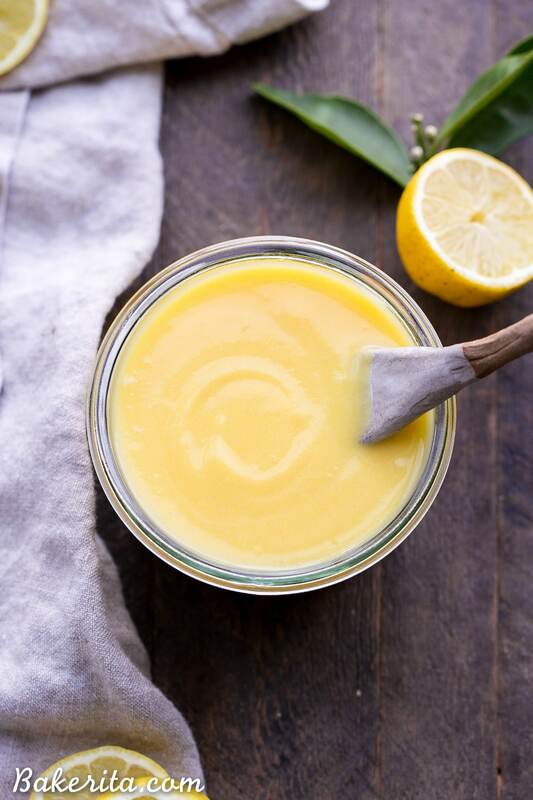 This Paleo Lemon Curd is easy to make, super silky, and perfectly tart. It’s a refined sugar free honey-sweetened recipe made with just five ingredients. It’s perfect to drizzle on pancakes or waffles, swirl into your yogurt, use it in baked goods, or just eat it with a spoon! 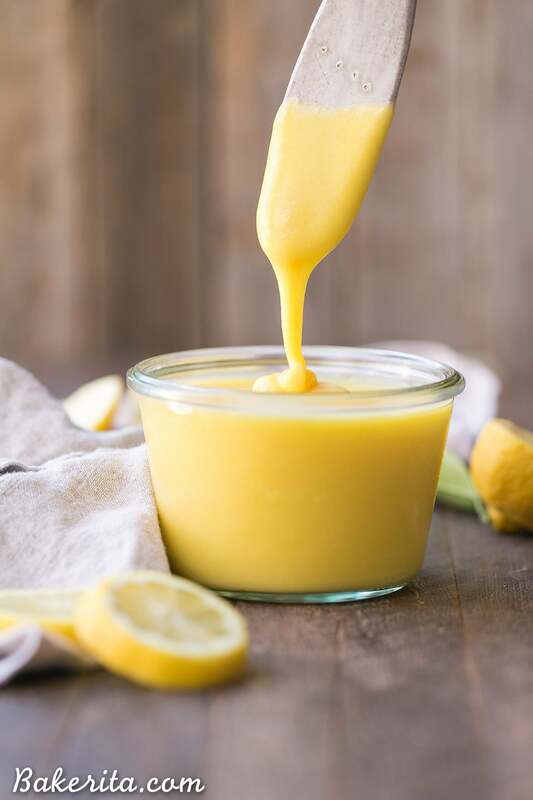 Since I don’t have anything wildly exciting or revolutionary to talk about, we’ll focus on the delicious topic at hand: silky smooth, perfectly tart paleo lemon curd. 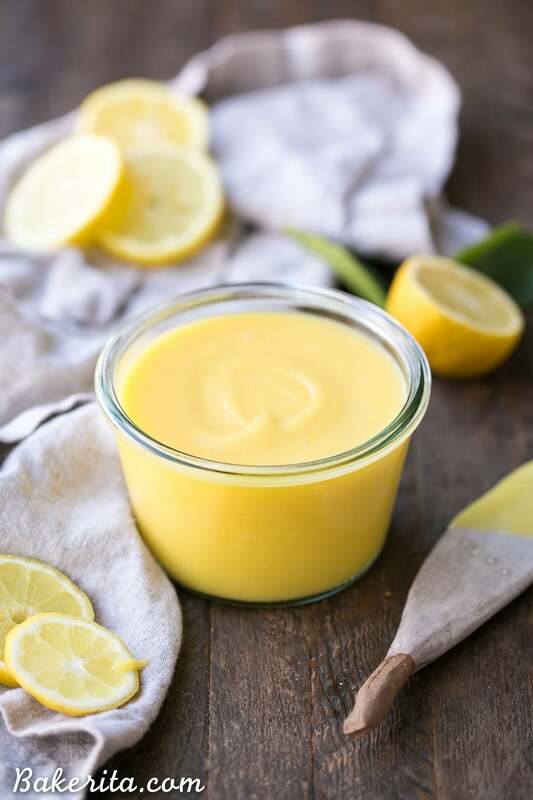 I’ve been feeling the citrus love a whole lot more this year, and I was craving lemon curd recently – which is not usual for me. I usually am not about sweet citrus flavored things, so most curds are way too sweet for me. That said, I had to make my own to satisfy the craving, cause nothing store-bought would satisfy the tart lemon curd I wanted. Luckily, it was so easy to make myself and I was enjoying spoonfuls of (hot) lemon curd in less than 20 minutes. I’ve made curds before, a while back, but I’d forgotten just how simple and easy it is to make them. Squeezing the lemons was the most annoying part of the whole process, and that was probably only because I had little farmers market lemons. This recipe only requires 5 ingredients: freshly squeezed lemon juice, lemon zest, honey, eggs, and ghee (or coconut oil). Because there’s so few ingredients, you’ve got to use the good stuff. I used some raw organic honey, and it provided the perfect amount of sweetness. I like my curd tart without too much sweetness, and the honey flavor complimented the lemon perfectly. You can add a touch more if you like a sweeter lemon curd. To make it, just whisk together all the ingredients except for the ghee, and heat them over medium heat. Once they’re warmed up, add the ghee so it melts right in. You can also use coconut oil if you prefer – I ended up using half and half of each because I was almost out of ghee. After heating for a few minutes, the curd will start to bubble and get thick enough to hold the trail of your whisk. Once it’s thickened to your preference, take it off the heat, strain out any egg bits that may have cooked, and let it cool down in the fridge to thicken up. I kept mine thinner so I could drip and drizzle it on all the things. I’ve had it on a smoothie bowl, drizzled on oatmeal, and uh…lots on a spoon. 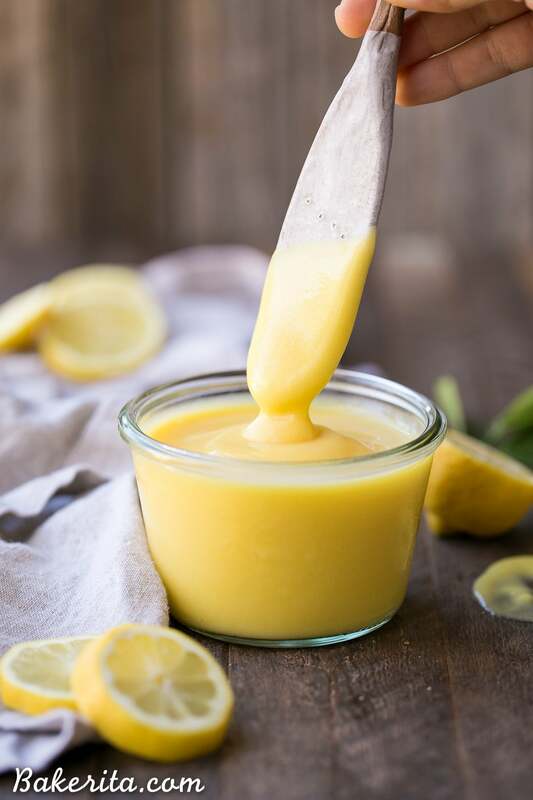 Also planning a few more recipes using this lemon curd to share soon, so whip up a batch so you’re READY! Whisk together juice, zest, honey, and eggs in a 2-quart heavy saucepan. Once it’s warm, whisk in the ghee or coconut oil and cook over moderately low heat, whisking frequently, until curd is thick enough to hold marks of whisk and first bubble appears on surface, about 6-8 minutes. Pour through a fine mesh sieve into a bowl to get out any cooked egg bits. Cover the top of the lemon curd with plastic wrap and chill until cold, at least 1 hour. So pretty! Great minds think alike with our lemon posts today :). Your lemon curd would be perfect in my coffee cake! Thank you!!! 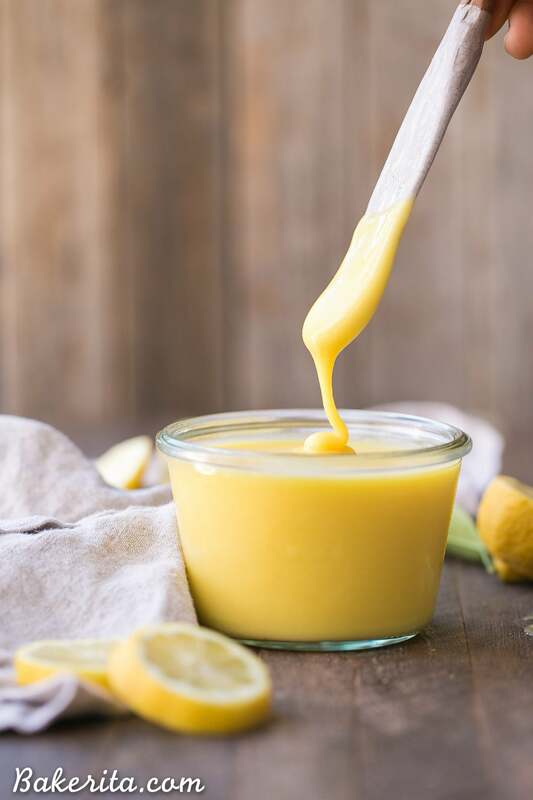 I used to make so much with lemon curd before I went Paleo, amd certainly before hubby became diabetic! This is do wonderful and such a treat!! Thank you again! Going to make a batch right now! What a gorgeous curd, Rachel! I’ve never made my own before, but now I need to start. I love that silky texture and flavor. I think I would just eat this with a spoon, looks amazing! Thanks so much Gayle! I’m so surprised you’ve never made curd before – seems like you’d be a pro :) you need to whip up a batch!! Just one of the reasons I can’t work in a coffee shop — I’m too self conscious! Lol. 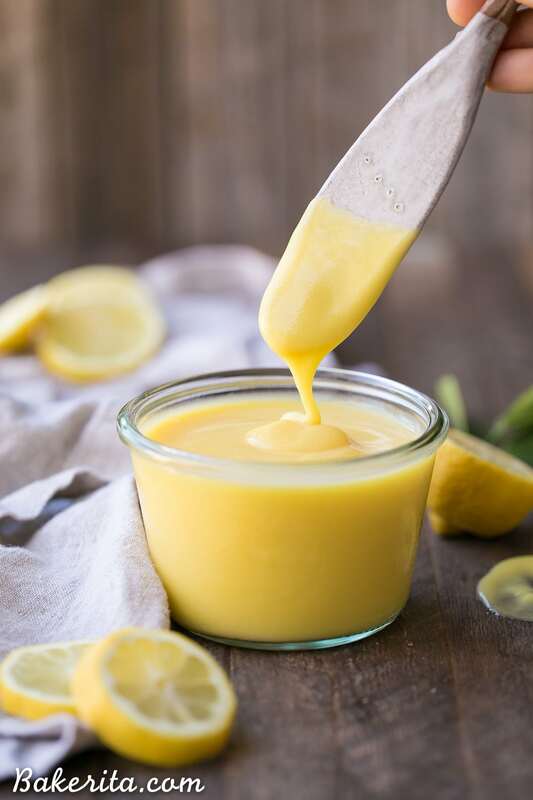 Lemon curd is one of my favorites and this looks amazing! Haha! Sometimes I need to get out and be with other humans :) people are always asking what I’m editing though, lol! Thanks so much, Ashley. haha definitely happens to me!! I usually start talking to my dog :) I swear I’m not crazy!! ANYWAY this lemon curd is gorgeous!! And it sounds just perfect! I’m making my son a lemon curd and chocolate cake for his birthday and I’m using this recipe for the curd! Yum! Love this version. Living in the UK people can get quite personal about their curd, and I too find them usually too sweet. I’ll give this a go for sure! Tart curds are definitely the best, thanks so much Debs! Hope you love it. Love this curd..as you say a hint of tart..but wonderful! Have not made curd for many years. This will be a regular treat! Thank you. So glad you’re enjoying it Lynne, thanks for your feedback! It should keep for a few weeks in the fridge, or you can keep it in the freezer for a few months. Enjoy!